Estramustine phosphate sodium, an antineoplastic agent, is an off-white powder readily soluble in water. 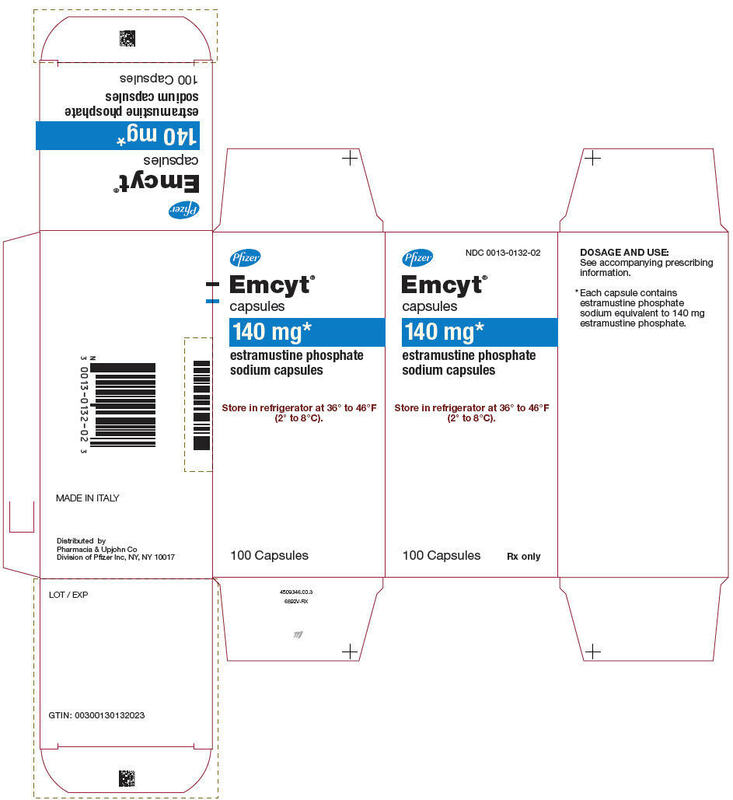 EMCYT Capsules are white and opaque, each containing estramustine phosphate sodium as the disodium salt monohydrate equivalent to 140 mg estramustine phosphate, for oral administration. Each capsule also contains magnesium stearate, silicon dioxide, sodium lauryl sulfate, and talc. Gelatin capsule shells contain the following pigment: titanium dioxide. 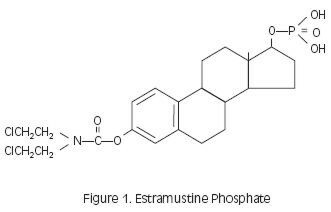 Estramustine phosphate (Figure 1) is a molecule combining estradiol and nornitrogen mustard by a carbamate link. The molecule is phosphorylated to make it water soluble. 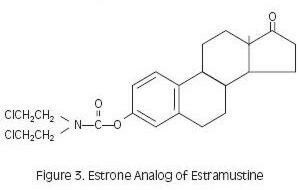 Estramustine phosphate taken orally is readily dephosphorylated during absorption, and the major metabolites in plasma are estramustine (Figure 2), the estrone analog (Figure 3), estradiol, and estrone. Prolonged treatment with estramustine phosphate produces elevated total plasma concentrations of estradiol that fall within ranges similar to the elevated estradiol levels found in prostatic cancer patients given conventional estradiol therapy. Estrogenic effects, as demonstrated by changes in circulating levels of steroids and pituitary hormones, are similar in patients treated with either estramustine phosphate or conventional estradiol. The metabolic urinary patterns of the estradiol moiety of estramustine phosphate and estradiol itself are very similar, although the metabolites derived from estramustine phosphate are excreted at a slower rate. Known hypersensitivity to either estradiol or to nitrogen mustard. Active thrombophlebitis or thromboembolic disorders, except in those cases where the actual tumor mass is the cause of the thromboembolic phenomenon and the physician feels the benefits of therapy may outweigh the risks. Glucose Tolerance—Because glucose tolerance may be decreased, diabetic patients should be carefully observed while receiving EMCYT. Elevated Blood Pressure—Because hypertension may occur, blood pressure should be monitored periodically. Fluid Retention. Exacerbation of preexisting or incipient peripheral edema or congestive heart disease has been seen in some patients receiving therapy with EMCYT Capsules. Other conditions which might be influenced by fluid retention, such as epilepsy, migraine, or renal dysfunction, require careful observation. EMCYT may be poorly metabolized in patients with impaired liver function and should be administered with caution in such patients. Because EMCYT may influence the metabolism of calcium and phosphorus, it should be used with caution in patients with metabolic bone diseases that are associated with hypercalcemia or in patients with renal insufficiency. Patients with prostate cancer and osteoblastic metastases are at risk for hypocalcemia and should have calcium levels closely monitored. Gynecomastia and impotence are known estrogenic effects. Allergic reactions and angioedema at times involving the airway have been reported. Because of the possibility of mutagenic effects, patients should be advised to use contraceptive measures. Certain endocrine and liver function tests may be affected by estrogen-containing drugs. EMCYT may depress testosterone levels. Abnormalities of hepatic enzymes and of bilirubin have occurred in patients receiving EMCYT. Such tests should be done at appropriate intervals during therapy and repeated after the drug has been withdrawn for two months. Milk, milk products, and calcium-rich foods or drugs may impair the absorption of EMCYT. Long-term continuous administration of estrogens in certain animal species increases the frequency of carcinomas of the breast and liver. Compounds structurally similar to EMCYT are carcinogenic in mice. Carcinogenic studies of EMCYT have not been conducted in man. 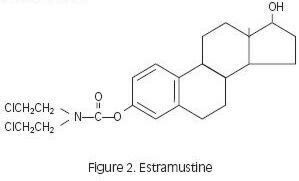 Although testing by the Ames method failed to demonstrate mutagenicity for estramustine phosphate sodium, it is known that both estradiol and nitrogen mustard are mutagenic. For this reason and because some patients who had been impotent while on estrogen therapy have regained potency while taking EMCYT, the patient should be advised to use contraceptive measures. Although there has been no experience with overdosage to date, it is reasonable to expect that such episodes may produce pronounced manifestations of the known adverse reactions. In the event of overdosage, the gastric contents should be evacuated by gastric lavage and symptomatic therapy should be initiated. Hematologic and hepatic parameters should be monitored for at least 6 weeks after overdosage of EMCYT Capsules. White opaque capsules, each containing estramustine phosphate sodium as the disodium salt monohydrate equivalent to 140 mg estramustine phosphate—bottle of 100 (NDC 0013-0132-02). EMCYT Capsules should be stored in the refrigerator at 36° to 46°F (2° to 8°C).